When I think of all the people, places, books, articles, blog posts, websites that inspire me, I wonder: where would my ideas come from if not from the sparks of inspiration provided to me by my ‘tribe’ of fellow thinkers, like-minded souls, inspirers? This simple cartoon speaks volumes to me. The more you collaborate, the more you will be inspired to create, which will lead you to further collaborative conversations, and so the cycle continues. I want to raise my bar because I have been inspired….to increase my skills and abilities. If I can inspire somebody to do something bigger and better than what they have done on their own, then ultimately I have done my job. As I begin a new year in a new school, I am inspired by my colleagues. 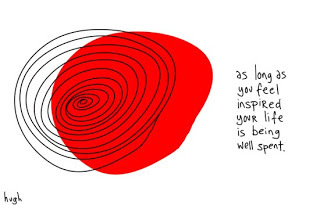 I am inspired by the friends and colleagues I have recently left behind to continue to look for new ways of doing while keeping some of the ‘old tricks’ I learned with them. I am inspired by the kids who I am yet to meet and their parents and am looking forward to an exciting, challenging year ahead.